Squat towers and castles dot the area in the heel of the boot. Originally built to protect from Saracens and other invaders. This is a vast region, in the heel of the boot, with squat medieval castles and windswept shoreline, where whitewashed villages tumble to the sea. Puglia is also the largest producer of grapes in all of Italy, and ancient olive trees stand watch along the roadside. If grapes and olives are abundant, tourists are not, at least in May. We heard little American-accented English, making for a good opportunity to sharpen Italian skills. 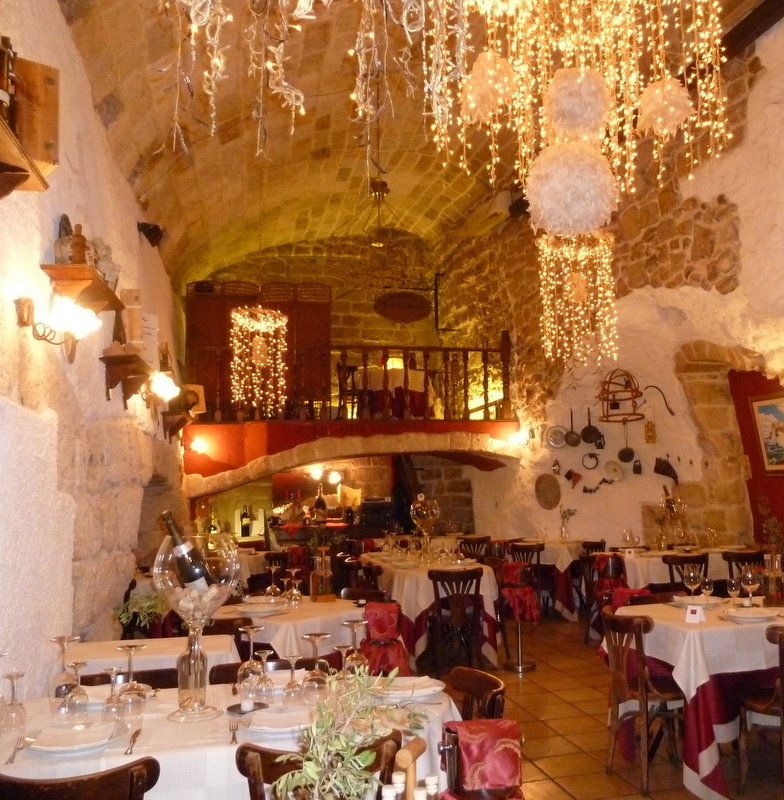 Ristorante Antiche Mura within the old walls of Polignano a Mare. 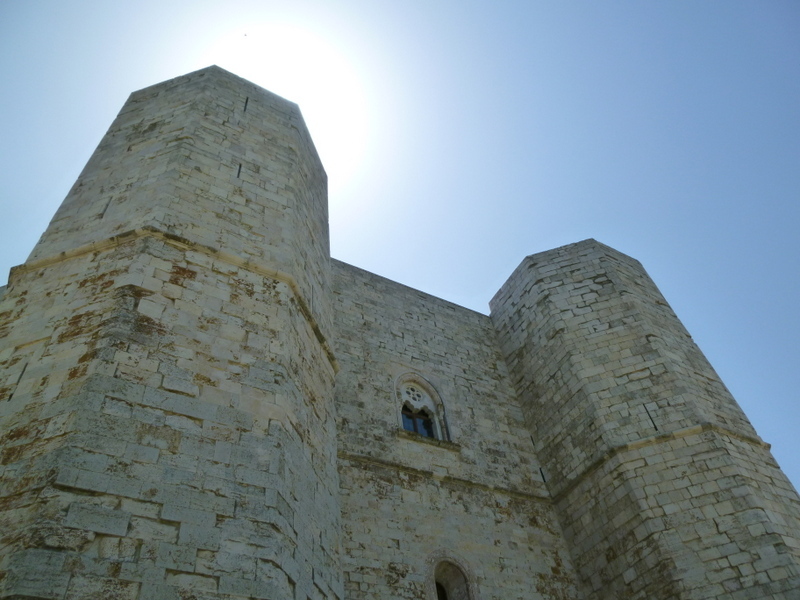 Gallipoli in Puglia is still a working port with a charming old town and, of course, a castle for protection. bottles of very fine local vino, our bill was about 20% less than the same meal would cost in Rome. Night number two was even more remarkable! At tiny little Cucina Casareccia in Lecce we were treated like family. Here we discovered the Puglian delight of purè di fave con chicoria (pureed fava beans with chicory), accompanied by antipasti della casa, verza con pecorino, (Savoy cabbage sautéed with pecorino cheese) and also a very fine octopus stewed in a special Puglian style. €25 per person with great house wine. Si mangia troppo, ma costo meno. This is a place you will not stumble upon in your meanderings. It’s on a dark and otherwise non-commercial street. You have to ring the bell to gain entry; An altogether different experience. Still, we are eating too much for a car-based trip. Ugh! At least we aren’t eating dessert. 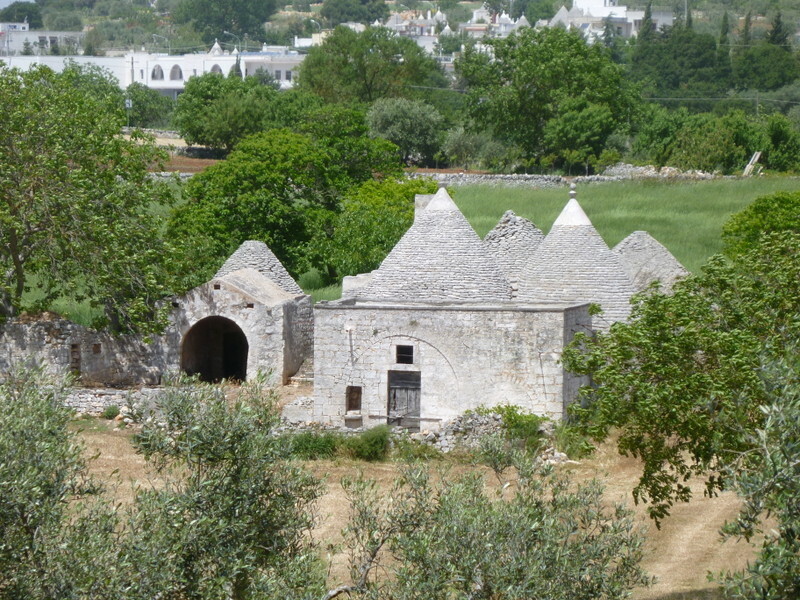 Traditional dwelling in Puglia, particularly in the area of Alberobello. The trulli give the landscape a fairy-tale-Tolkien-kind of feel. 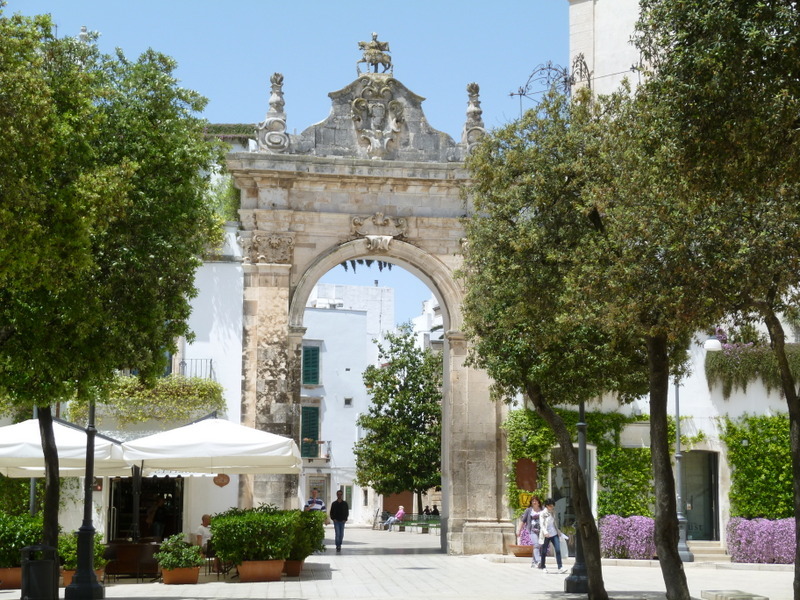 You’ll not find a prettier town in Puglia. Kind people, great food, welcoming green spaces. We intended to stop for a light lunch, having sworn off midday pasta after Thursday’s gluttony. But when we invaded Ristorante ai Portici, the waiter/owner kept the food coming (Si mangia troppo) from a free starter through a giant salume and cheese platter he insisted we must have because Ric’s entrée was going to take 15 minutes to cook. Once again I indulged in the local specialty fava bean puree with chicory, and once again we rolled out more-than-satiated. €75 for four people with wine (costo meno). 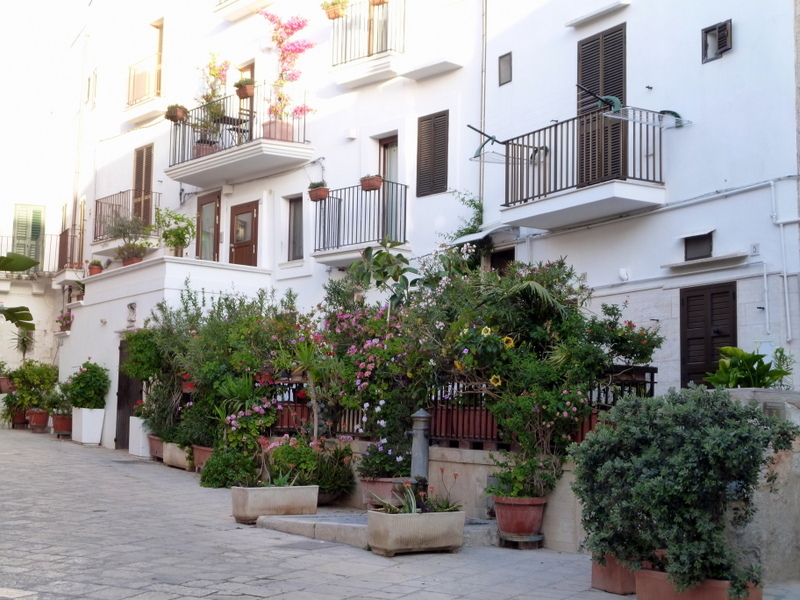 The best part: an owner who was so attentive, so proud of his food, and a location evocative of the best of Italy in a charming Puglian town. Whitewashed Polignano a Mare, a pleasant stroll through quiet streets at dawn. Polignano a Mare is a decidedly different side of Puglia, right on the Adriatic sporting a fun-by-the-sea feel. There is a charming old town, Roman ruins, and it’s not far from Castel del Monte, a Castle built by Emperor Frederico II in the 13th century. Well worth a visit as there is no castle like it anywhere on earth. 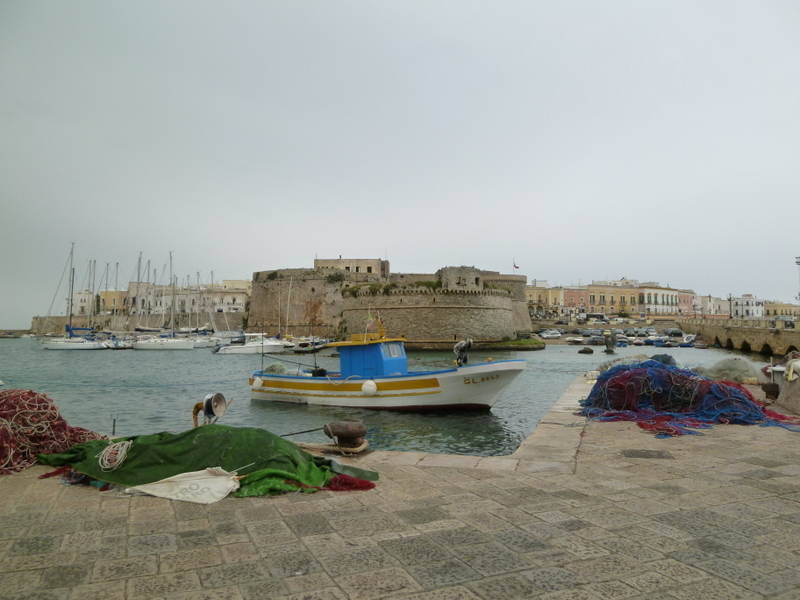 And there is food: Polignano features magnificent seafood and the Puglian specialties continued to amaze us and inspire us to find activities requiring us to expend some calories. After two nights of stuffing ourselves on grilled orate (sea bream), alici (anchovies), octopus salad, marvelous local vegetables, shellfish pasta, and some of the very special wines of Puglia, we headed for home by way of Abruzzo. More to come…. 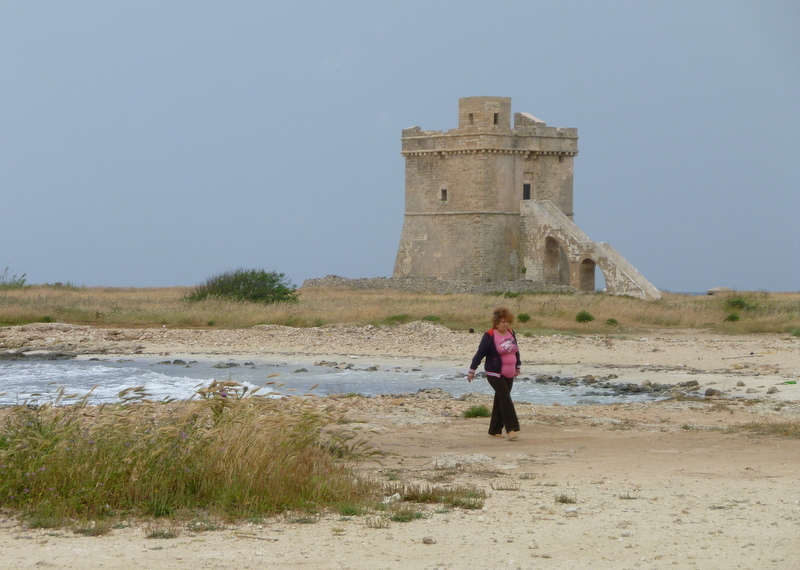 We will be going to Puglia in April/May of next year…can you give us hotels you stayed in while in Puglia? I just found your blog and just love it and living vicariously through you. I’ve just come back from 5 nights in Polignano a Mare and loved it too. Did you eat at Infermento? We went there twice, the manzo alla primitivo was amazing! Lovely little town. Thanks for the comment! We did not find Infermento, but dined rather well at Antiche Mura one night and Il Bastione another. Every meal we had in Puglia was terrific. Weather could have been a tad warmer. Oh, here’s another place we’ll have to put on “the list”! I know how you feel! The list gets longer –not shorter — the more we do. Your descriptive words paint beautiful pictures as I read…makes me hungry, too! Sounds like you’re living the dream! We are so happy for you. Ciao Janet! Thanks for the spices! Can’t wait to make Lebanese specialties with them!